Group on Earth Observations (GEO) is an intergovernmental organization which develops and implements a Global Earth Observation System of Systems (GEOSS). The GEO’s vision is to realize a future where decisions and actions, for the benefit of humankind, are informed by coordinated, comprehensive and sustained Earth observations and information services. The 2017-2019 GEO Work Programme was accepted at the Thirteenth GEO Plenary held in Saint Petersburg, Russia. There are currently 104 countries + EC and 118 Participating Organizations in GEO. GEO contributes to the global agenda. At the Ministerial Summit in Mexico City, ”GEO Strategic Plan 2016-2025: Implementing GEOSS” was endorsed. At the Ministerial Summit in Beijing, China, Beijing Declaration endorsed the “Strategic Targets: GEOSS Implementation by 2015,” and committed to developing frameworks to ensure that a more open data environment. At the G8 Summit in L’Aquila, Italy, the G8 members asserted to support the ongoing work on the development of the Global Earth Observation System of Systems (GEOSS), addressing the increased threats of natural disasters and extreme weather phenomena caused by climate change. At the G8 Hokkaido Toyako Summit, world leaders expressed in the summit leaders declaration that they will accelerate efforts within the Global Earth Observation System of Systems (GEOSS) to respond to the growing demand for Earth observation data, by strengthening observation, prediction and data sharing. Cape Town Declaration, which confirmed to strengthen international cooperation on terrestrial, oceanic, and satellite observations, was adopted at the Ministerial Summit in South Africa. The G8 leaders made a clear commitment to take leadership in developing GEOSS at the Summit in Heiligendamm, Germany. At the G8 Gleneagles Summit, Heads of State stated to move forward in the national implementation of GEOSS in their member states and support efforts to help developing countries and regions obtain full benefit from GEOSS, welcoming the adoption of the GEOSS 10-year implementation plan. At the Third Earth Observation Summit, endorsed the GEOSS 10-Year Implementation Plan and established the intergovernmental Group on Earth Observations (GEO) to carry it out. The Second Earth Observation Summit was held in Tokyo, Japan, adopted a Framework Document defining the scope and intent of a Global Earth Observation System of Systems (GEOSS). The First Earth Observation Summit was convened in Washington, DC, U.S. Governments adopted a Declaration signifying a political commitment to move towards development of a comprehensive, coordinated, and sustained Earth observation system of systems. 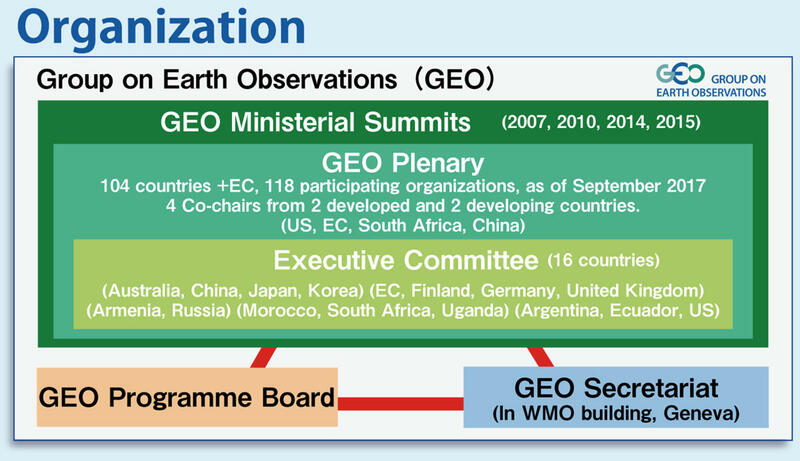 The Summit established the ad hoc intergovernmental Group on Earth Observations (ad hoc GEO), co-chaired by the European Commission, South Africa. United States and Japan. The Summit tasked it with producing a framework document for a Global Earth Observation System of Systems (GEOSS) 10-year implementation plan at the Tokyo Summit in April 2004 and setting its full implementation plan in February 2005. At the G8 Evian Summit, affirming the importance of Earth Observation as a priority activity, drawing up10-Year Implementation Plan and holding ministerial meetings were agreed. The World Summit on Sustainable Development (WSSD) in Johannesburg, South Africa, highlighted the urgent need for coordinated observations relating to the state of the Earth, responding to increasing awareness on global environmental concerns in the world from the latter half of the 20th century. For more information about History of GEO, please visit GEO HP.